Hits, Hits, Hits aus den Bereichen: Grunge, Pop, Punk, Independent, Guitar, Postpunk, Alternative, Britpop, Elektrorock, Melodycore und Crossover! 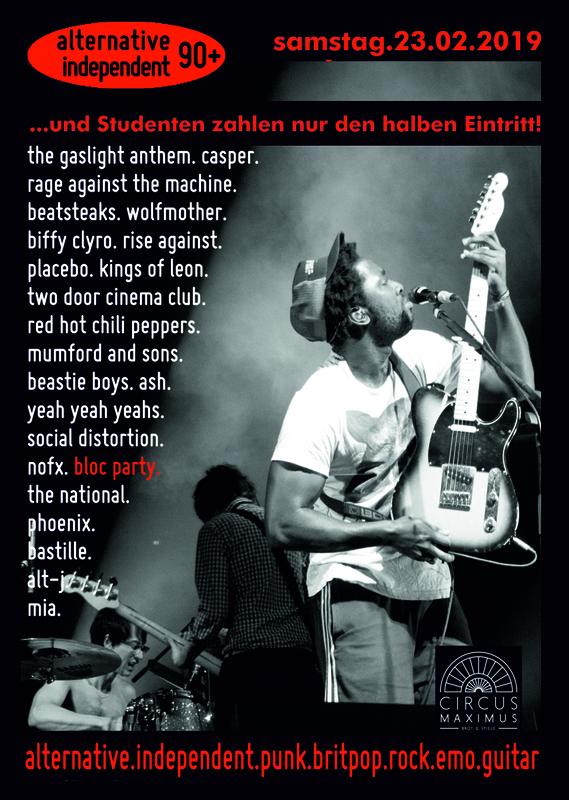 Das „Southside“ trifft „Rock am Ring“: the Notwist, Chvrches, Jake Bugg, alt j, the Ataris, Casper, Bilderbuch, Refused, Bastille, Boy, Two Door Cinema Club, Rage Against the Machine, Arcade Fire, Nirvana, The National, Pearl Jam, Bloc Party, Red Hot Chili Peppers, The Killers, Beastie Boys, Rise Against, Jimmy eat World, NoFx, Phoenix, The Pixies, Kings of Leon, Queens of the Stoneage, Placebo, Blur, Gossip, Deftones, Kaiser Chiefs, Kraftklub, Mumford and Sons, Me first and the gimme gimmes, Billy Talent, Beatsteaks, Foo Fighters, Blink 182, Arctic Monkeys, The Hives, Interpol, Mando Diao, Seeed, Nothing but Thieves, The Kooks, PORTUGAL. THE MAN…und viele mehr! Es gibt Berliner Luft für nur 1,- € !!! See you!